It was the late 70s. I must have been thirteen or fourteen years old and I often spent more time at my friend Adrian’s house in Bounds Green than I did at my own. I was in awe of his film star-esque mum Eleanor (part-time opera singer, part-time antiques dealer) and his sister Therri (probably still the person I would have most liked to have looked like). The house was a dog-smelling chaotic mix of antiques and dust. The colours throughout were dark and brooding, with intense colour in unexpected places. There was nothing contrived about the house, it just oozed casual style and screamed ‘home’ to me like nothing else. Eleanor was my self-appointed mentor. She was slovenly, selfish and demanding, and I learned all I could from her! There was a skip outside one weekend and I saw a small wooden Burmese dragon lamp hanging over the side. It was perhaps 2 ft tall, and would have matched the enormous standard lamp version in her living room. I could see it was damaged, but I asked if I could take it. Of course, she said yes. Her husband John was clearing out some of her old stock which she had no room to store in either the shop in Islington or in the house. I grabbed the light and scoured around. 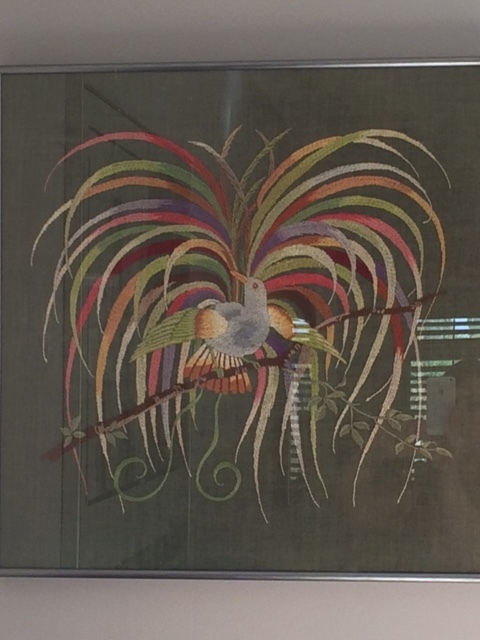 The other thing that caught my eye was the most gorgeous embroidered picture I had ever seen. It was all the colours of thread sewn onto a beautiful green background backed by simple cardboard. Someone had obviously spent their own personal hours meticulously creating this and yet it had ended up in a skip? My gut feeling then was – and it still is – that it was sewn in the 1930s. I hung it in every bedsit and flat I lived in and then when I bought my first home at 21 years old I splashed out and had it framed. The framer in Porlock in Somerset was intrigued, and he suggested that it was older than I thought, but I doubt I will ever know. It remains in the same frame and has pride of place in our living room. I look at it every day and would never part with it. I think colours and style point to 20’s/30’s also . Interesting that you “picked up” your first vintage piece at 14, so did I.